This is a special beer as it isn't originally an American one. 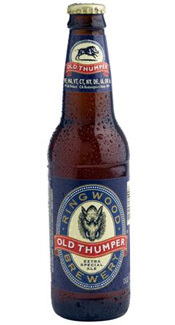 The story of this beer starts in Ringwood England at the Ringwood Brewery where it stands as their flagship beer. Lucky for us colonials Shipyard Brewery's brewmaster Alan Pugsley worked at the Ringwood Brewery and tutored under their brewmaster who allowed him to take this recipe to America and be brewed solely under the Shipyard name. So what we are tasting isn't just another great Shipyard beer but a great European beer that no other brewery can offer. But what makes this beer so special isn't it's history but the special Ringwood yeast strain that is used. This yeast comes from the town of the same name that imbues a unique buttery (diacetyl) flavor which gives beer a rich, buttery smooth palate. So if you like ringwood beers then you must go out and try this one. It's a rich, sweet, medium bodied, buttery yet bitter beer that is balanced extremely well. I highly recommend. Cheers! Appearance: Crystal clear burnt orange color with a thick two-finger head that sat on top of the beer like a dollop of cream until dissipating into a fine film. Not a whole lot of lacing happening here just a little sticking to the glass when swirled vigorously. Carbonation was good and continued to stay strong throughout the entire review. Smell: This old English beer has a subtle yet complex nose with soft scents of sweet malts, citrus esters, earthy hops and a pleasant buttery (or as the professionals would say, diacetyl) smell that alerts you to the fact that this baby was made with that special ringwood yeast. Initial Taste: Taste begins with a nice medium body that is quite sweet with a crisp maltiness that covers the pallet. That buttery scent we picked up in the nose makes it’s presence very well known. While being quite a buttery flavor there is a nice hop backbone that cuts through and brings a well needed shot of bitterness into the taste. The finish is a slightly fruity, bitter hoppiness that lingers just long enough to pull you back in for a second drink. Aftertaste is clean and dry with slight bitterness. Thoughts: This is a special beer as it isn’t originally an American one. The story of this beer starts in Ringwood England at the Ringwood Brewery where it stands as their flagship beer. Lucky for us colonials Shipyard Brewery’s brewmaster Alan Pugsley worked at the Ringwood Brewery and tutored under their brewmaster who allowed him to take this recipe to America and be brewed solely under the Shipyard name. So what we are tasting isn’t just another great Shipyard beer but a great European beer that no other brewery can offer. But what makes this beer so special isn’t it’s history but the special Ringwood yeast strain that is used. This yeast comes from the town of the same name that imbues a unique buttery (diacetyl) flavor which gives beer a rich, buttery smooth palate. So if you like ringwood beers then you must go out and try this one. It’s a rich, sweet, medium bodied, buttery yet bitter beer that is balanced extremely well. I highly recommend. Cheers!